We wanted the town of Hackberry Hollow and surrounding area to feel like Pennsylvania or 19th century New York in terms of architecture, calling back to the ghost stories of the last century. A lot of the concept art we’re doing now is for the historical setting so that the current setting reflects its history. This kind of architecture has the right feel for the events in the backstory and the creepy aftermath. Interesting that you quote Song of the South for a while in here. Only one out of four are dead? I would’ve thought it would be higher. . .
Keep in mind that while there are a lot of necromancers there, not everyone is; but a major part of the local economy is based on the fact that illegitimate stuff happens here. And yes, we do have two classes of undead in the comic: ghouls and undead. Ghouls are feral and undead are intelligent and can talk. You can tell the difference by the color of the glowing eyes: red for ghouls and green for undead. I like that movie and hear the song Zip-A-Dee-Do-Dah quite often. I am curious though, is this story connected to Pironizo? Yup, it is Pironizo. 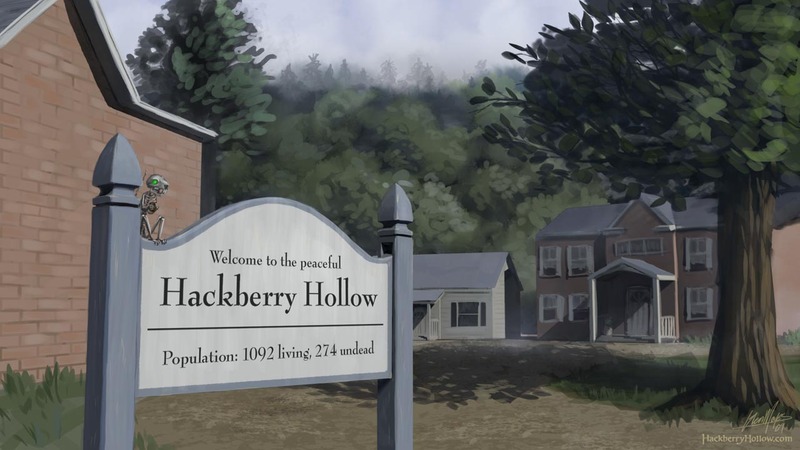 We changed the name to Hackberry Hollow. howdy pardner! i’m likin the way things look. just like and old pennsylvania town. i grew up just across the river so i’ve seen them before.